SNOW READY 4X4 1 OWNER PERFECT CARFAX, ALL NEW TIRES, XM BLUETOOTH, 59K mi $2K UNDER KBB!! Just in! 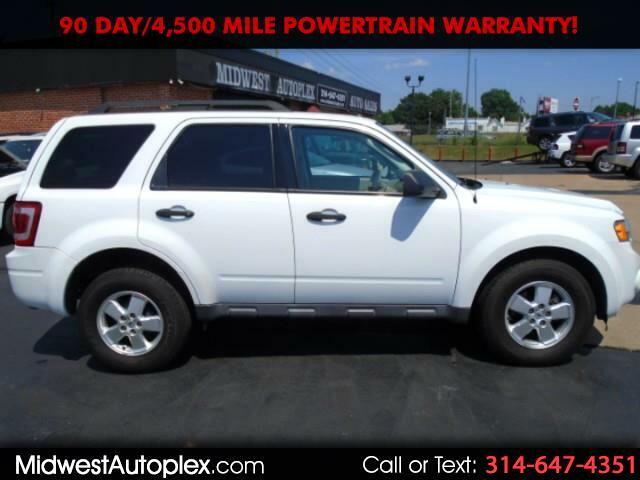 Check out this Low Low mileage 2012 Escape! It’s one of the most popular 4x4 models out there, it’s proven to be safe, reliable and an excellent investment--a proven value you’ll love. Make it yours before it’s gone! PRICED $2,162 UNDER KBB retail!!! PWR SEAT, One Owner, XLT 4X4 Impressive Perfect Carfax!! VERY GOOD CONDITION, XM, BLUETOOTH, AUX INPUT, RUST FREE VIRGINIA CAR, FEW SCRATCHES, CLEAN INTERIOR LOW LOW MILES! CREAM PUFF!! CRUISE CONTROL, POWER Everything, ABS, CD, 95% Tire Treads, Terrific gas mileage! Economy smart! Great for kids! Perfect first car! Perfect graduation gift! Runs great and drives excellent. Extra Clean, Non-smoker, Carfax Clean! Just e-mail us for a FREE copy. EASY No Haggle Price! A+ rated by Better Business Bureau. Our Clients are extremely important to us and it shows. Financing Available (W.A.C.) at 3.75%. Try $210 per month with NO MONEY DOWN. Midwest Autoplex makes car buying easy and hassle-free. Our upfront prices are the same online and on our lot. Car shopping should be fun and easy. At our lot it is! Our set prices mean you’ll never have to haggle and you can concentrate on finding the right car for you. We stand behind each and every used car we sell with a 90-Day Limited Warranty. Visit http://www.midwestautoplex.com/or Call 888-427-0565 or after hours 314-749-5258 Family owned and operated where we treat employees and customers as part of the family, discover the difference. We can arrange financing, extended warranties and delivery for you. We help people find the vehicle of their dreams at a price that is not a nightmare! Thank you for supporting my USA small business! You'll love the way we do business. Thanks for your visit. A $100 admin doc fee applicable to all vehicles purchased. In order to better assist your purchase experience, appointments are strongly encouraged. Call Dealer to confirm availability, and schedule a hassle free Test Drive. This comes with a CARFAX Buyback Guarantee, which means you can buy with confidence and peace of mind. Experience Car Buying Made Simple with Enjoyable upfront pricing and interact with non-commissioned staff for a pressure free deal. **Dealership Provides a 90 Day/ 4,500 Mile Limited Powertrain Warranty for Your Protection! ** FREE BOTTLE OF HOMEMADE WINE WITH EVERY PURCHASE!! It is the buyers responsibility to verify options, accessories, condition, and warranty with your sales professional before time of sale. We make every effort to present information that is accurate. However, it is based on data provided by the vehicle VIN decoding and/or other sources and therefore exact configuration, color, specifications & accessories should be used as a guide only and are not guaranteed. Under no circumstances will we be liable for any inaccuracies, claims or losses of any nature. Furthermore, inventory is subject to prior sale and prices are subject to change without notice. Close but no cigar? Not to worry; we have others. Check them all out at www.midwestautoplex.com or ring us for the skinny on new upcoming arrivals! **OPEN EVERY OTHER SATURDAY BY APPOINTMENT ONLY TILL NOON** FREE BOTTLE OF HOMEMADE WINE WITH EVERY PURCHASE!! Must be 21 years of age. **Dealership Provides a 90 Day/ 4,500 Mile Limited Powertrain Warranty for Your Protection on select models!! FREE Generic Title history, Auto Check or Carfax Report on all cars. A $100 admin doc fee applicable to all vehicles purchased. Visit Midwest Autoplex online at midwestautoplex.com to see more pictures of this vehicle or call us at 314-647-4351 today to schedule your test drive or 314-749-5258 after hours/weekends. We are typically open every other Saturday from 8am to Noon or by appointment; *****Why buy from Midwest Autoplex? **** (1) We are a No-Hassle No-Haggle dealership! We pre-discount our cars, so there is no need to worry if you're getting the right price. (2) Our salespeople are non-commissioned, and trained to be more of a Buyer's Assistant than a typical sales person. (3) All our vehicles are Handpicked, Inspected, and Protected and go through a meticulous inspection process. (4) A vehicle history report is provided with each car priced over $10k. (5) Are you are looking to sell your car? Consider us your first option, we'll buy your car! (6) FTC's Cooling-Off Rule does not apply and all sales are final with no returns. Get a CARFAX Buyback Guarantee when buying this car to give you peace of mind.